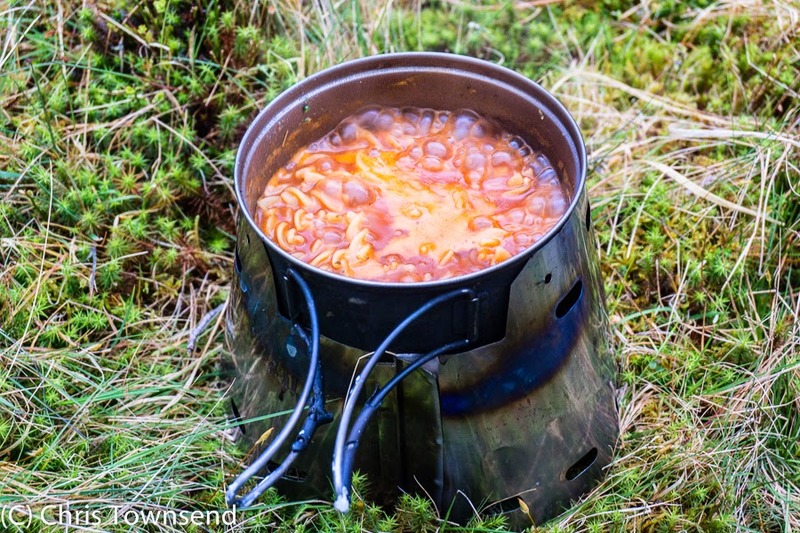 Some thoughts on camp cooking - first published in The Great Outdoors several years ago. I haven't changed my approach! The cold rain lashes down. Fingers fumble with guylines and thrashing wet nylon. The sky is darkening as night approaches. Finally the tent is up and you can slip inside, out of the storm. The stove is set up in the porch. A click of a lighter, the hiss of gas and surprising heat rises from the little ring of flames. A pan of water is placed on the stove. While it heats big spoonfuls of chocolate drink powder are heaped into a mug. The anticipation of the warming drink to come is great but nothing like the reality when the sweet hot liquid slides down your throat and sends warmth surging through you. At last you can relax and start to enjoy the camp, the shelter from the rain and wind and the pleasure of just lying there listening to the spattering on the flysheet. While sipping the hot chocolate you look through the food bag. Soup first or straight to the main meal? Soup for more warmth and liquids, you decide. Mushroom or tomato? The first tonight. Then the main meal. Pasta again, with broccoli and cheese this time. Again just thinking of the food is enjoyable. After eating you know you will feel tired and soon fall asleep, warm and comfortable, which is also a pleasant thought. 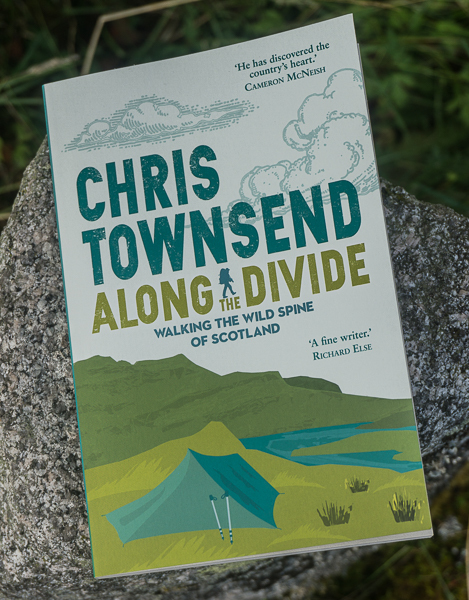 On cold wet nights like that hot food and drink, prepared under cover, is one of the great joys of wild camping. I love the way energy and warmth are restored by the simple food I have carried and cooked. There’s nothing more deeply pleasurable than taking the first mouthfuls of hot soup after a long day in the wilds as a storm batters the tent. I have spent many nights relishing the rituals of setting up the stove, arranging my few kitchen items and sorting through my supplies. Watching the stove flame flicker and hearing the bubbling of the water as it comes to a boil is always a welcome activity. As well as the immediate pleasure of eating and drinking I know that the energy from the hot food and liquid will help keep me warm during the cold night to come. Of course cold food could provide the same energy but there’s not the same immediate warming or the positive psychological effect of a hot meal. 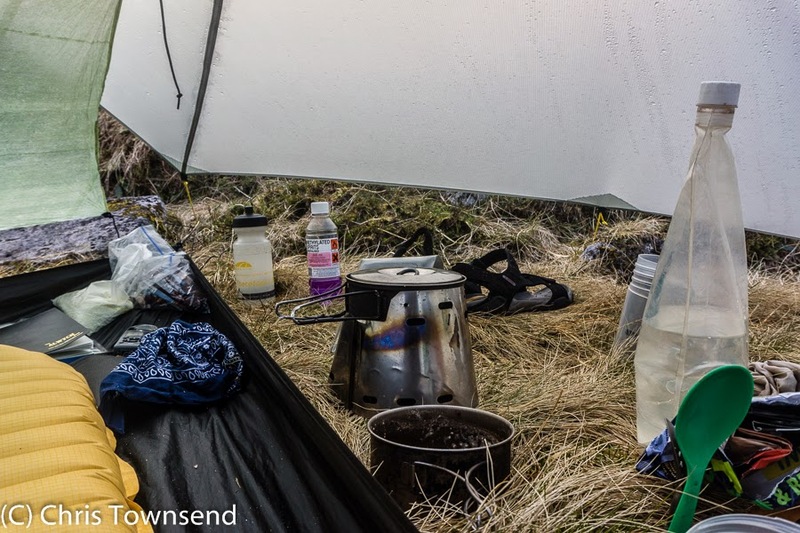 Camp cooking is such an important part of backpacking for me that even when the weather is warm and sunny I still make hot drinks and prepare hot meals. It wouldn’t feel like a real camp without them. There isn’t the same urgent desire for hot sustenance that occurs in the cold and wet but the enjoyment is still there. Perhaps the most pleasurable outdoor meal is breakfast, that reviving repast that helps you wake and which is eaten with the exciting thoughts of a day in the wilds ahead. 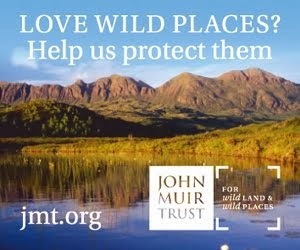 This is especially so when the weather is dry and the sky clear. Waking on a frosty morning fills me with joy as I look out on the crisp white ground and the brightening sky. Rather than dash off into the new day I like to welcome the dawn slowly, over a hot mug of coffee and a bowl of muesli porridge. Lying in my sleeping bag while I eat breakfast and watch the sun slowly creep down the hillsides towards my camp is a truly luxurious experience. 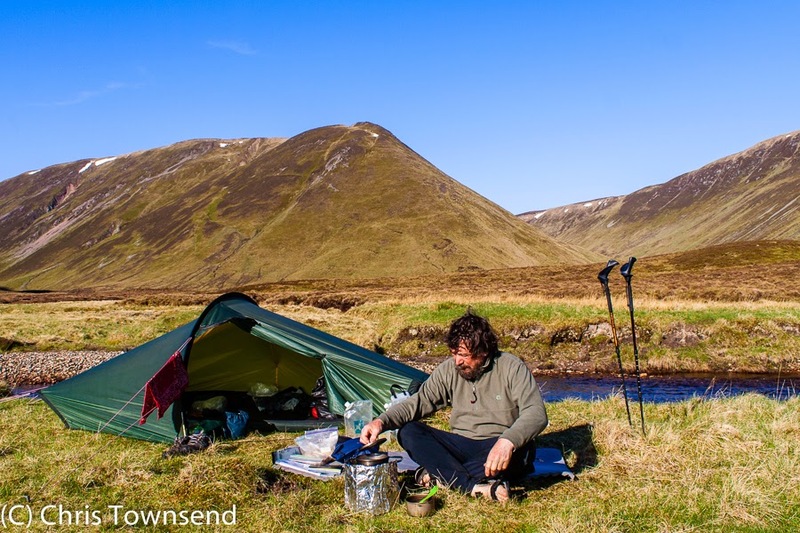 Whilst the practice of setting up the kitchen, boiling water and preparing meals and drinks is central to camping for me this doesn’t mean complicated recipes or meals that take ages to cook. Far from it. The opposite is in fact true. I like simple meals that are quick to prepare. Dehydrated and freeze-dried foods make up the bulk of my outdoor diet and my food bag is full of foil packets and plastic bags full of dusty dry powders. On a scale running from gourmet foodie to survival eater I am close to the latter. This doesn’t mean I don’t enjoy the food though. A mug of instant soup with a few herbs and spices and a sprinkle of cheese added tastes delicious in the wilds, as does cheese and macaroni out of a packet or a curry made from couscous, dried vegetables, soya mince and curry powder. At home I would find such fare rather unappetising but I learnt long ago that trying backpacking meals at home, as if often advised, was a waste of time. They have to be tried in the field after a day on the hill to be really appreciated. I can go long periods on dried food without becoming fed up of it though I must admit that sometimes when the prospect of fresh food approaches it can suddenly seem unattractive. The longest I’ve subsisted on dried rations is 23 days, which I’ve done twice, and on both occasions the last few days were spent drooling over the thought of eggs, orange juice, pizza and freshly baked bread. This was particularly so on the Pacific Crest Trail when the going through the snow-bound High Sierra was very tough, my energy output great and the calorie content of my food inadequate. I lost a couple of stone during those three weeks that even five or six restaurant meals in two days didn’t replace. Yet now it is the meals cooked over my little petrol stove at spectacular camps high in the mountains that I remember rather than the undoubtedly more sumptuous restaurant dinners. I think much of the delight in camp cooking is a primitive enjoyment of being comfortable and warm outdoors with just the aid of thin shelter and a small stove. 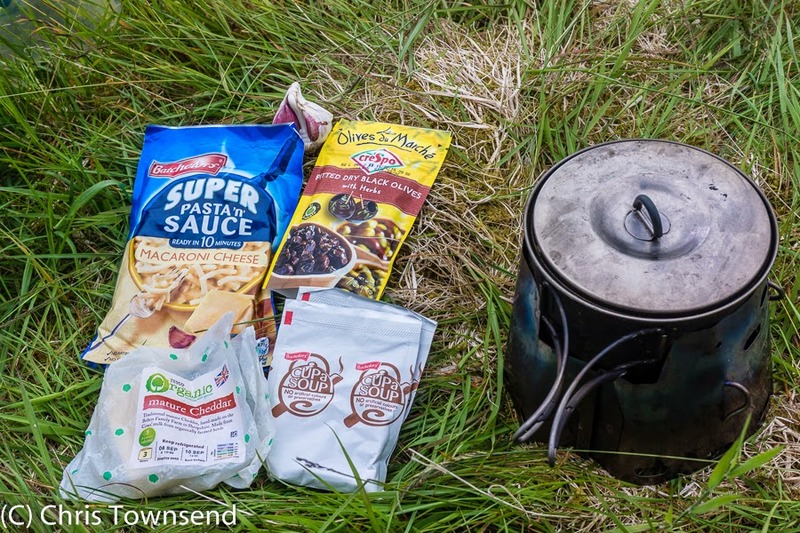 Being able to make hot food and drink is a way of knowing that you can cope and live in the wilds - even when you have brought everything with you. 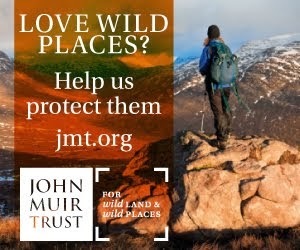 This sense is enhanced if you’ve ever spent much time in the wilds with dwindling supplies, as I did during my walk the length of the Canadian Rockies when I became somewhat unsure of where I was for over a week during which I had much arduous cross country walking in dense forest and deep canyons. For several days I subsisted on a few crackers, instant cup-a-soups, half cups of coffee and a few bits of dried fruit. When I eventually came out of the wilderness and reached a roadside campground the fizzy cola drink other campers gave me tasted like nectar. 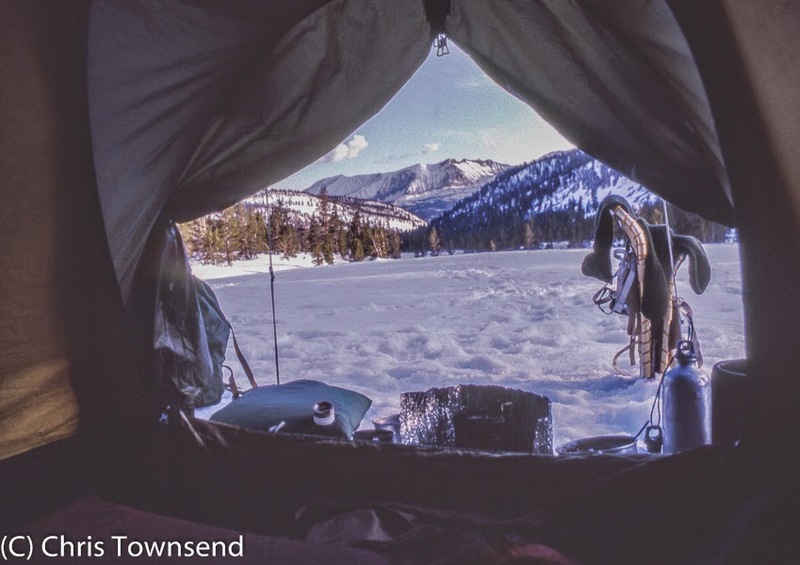 Sitting in the tent with a full belly I often remember those days and vow never to repeat them.